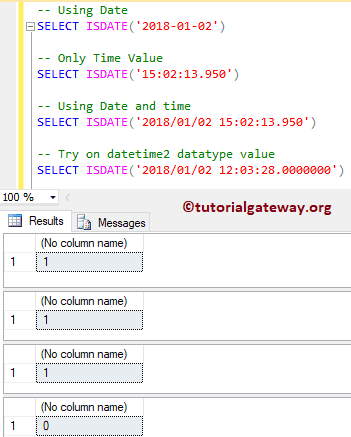 The SQL ISDATE is one of the Date and Time Function, which will check whether the given expression is date or not. If the given expression is Date, Time or Datetime then it will return 1, otherwise 0. This article will show you, How to use this ISDATE function in SQL Server with example. The return value of this function is always depends upon the SET DATEFORMAT and SET LANGUAGE statements.